The Green Goblin as he appears in the 1967 Spider-Man cartoon. The Green Goblin is a fictional Marvel Comics alias that have appeared in a range of media, usually by Norman Osborn and Harry Osborn. The Norman Osborn version of Green Goblin appeared in the 1960s animated television series, voiced by Len Carlson. The character is depicted as a dimwitted, spoiled robber who is obsessed with magic and the supernatural - fields of expertise that the original iteration is never interested in, preferring to use technology to commit crimes. 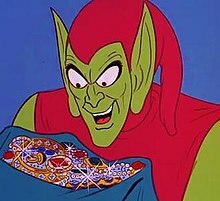 The Norman Osborn version of Green Goblin appeared in the 1981 Spider-Man cartoon, voiced by English actor Neil Ross. This series' depiction of the character is much closer to the comic book original than the preceding animated incarnation. He appears in the episode "Revenge of the Green Goblin". In the episode's continuity, Spider-Man first faced and defeated the Green Goblin three years earlier, during which the opponents were unmasked to each other. Having regained his memory during a train accident at the start of the episode, Osborn resumes his Goblin persona and equipment, and threatens to reveal Spider-Man's true identity to the world. The Norman Osborn version of Green Goblin appeared on the concurrent Spider-Man and His Amazing Friends, voiced by Dennis Marks. This incarnation is depicted as something closer to the Lizard with a serious medical problem of physically and uncontrollably changing into the Green Goblin. The character has a niece named Mona Osborn (voiced by Sally Julian) that had no knowledge of her uncle's double identity. When she was held captive by the Goblin so he could discover the location of a formula, she stated that he looked familiar. Norman Osborn is cured by lightning and send back to Medical Institute. The Green Goblin in Spider-Man: The Animated Series. Both versions of Green Goblin appeared in the 1990s Spider-Man: The Animated Series, with Neil Ross reprising the role from the 1981 series as Norman Osborn, with Harry Osborn voiced by Gary Imhoff. A Counter Earth version of Green Goblin appeared in the Spider-Man Unlimited animated series, voiced by Rino Romano. This version is portrayed as a hero, mistaking Spider-Man for an enemy during their first encounter. Instead of a glider, he wields a backpack that sprouts wings. He saves Naoko Yamada-Jones and Shayne Yamada-Jones from one of Venom's and Carnage's plans with Spider-Man's help. After the Goblin lets Naoko and Shayne go, he whispers to himself about calling Naoko his love. It's revealed that Naoko has a jealous ex-husband who works for the rebellion against the High Evolutionary. Naoko's ex-husband (standing in the shadows) reveals that he's jealous, suspecting that Naoko and Peter Parker are having an affair. He punches a wall that bricks fall down, thus confirming the Goblin is indeed Naoko's ex-husband. The Goblin's next appears when he finds out that both Spider-Man and Peter are the same person. He also learns that Spider-Man is from the original Earth, and the hero's intentions on Counter-Earth are John Jameson's rescue. Since Jameson, working with the rebels against the High Evolutionary, doesn't agree to come and lets Spider-Man go off on his own, the Goblin decides to help by getting a ship the High Evolutionary has which was originally Spider-Man's. Spider-Man and the Goblin team up with the Rejects, a group of Beastials that the High Evolutionary got rid of since they proved useless, and they get to Solaris II (the ship Spider-Man once had). However, Spider-Man has more heart and has Solaris II crash into one of the High Evolutionary's towers which presumably kills the Goblin in the explosion. But by the series finale, it is revealed he survived and joined the Rejects. He leaves them to help Spider-Man and the rebels fight against the High Evolutionary. He is one of the characters who ran off when thousands of symbiotes spring to Counter-Earth according to Venom's and Carnage's plans. The Green Goblin in The Spectacular Spider-Man. The Green Goblin appears in The Spectacular Spider-Man animated series, voiced by Steven Blum. This version's identity is either Norman Osborn (voiced by Alan Rachins) or Harry Osborn (voiced by James Arnold Taylor). In season one, the Goblin first appears as a mysterious criminal attempting to overthrow the Big Man as New York's reigning crime boss equipped with stolen technology from OsCorp. After a several battles with the Goblin, Spider-Man initially suspects Norman, seeing the villain return to the Osborn residence, but instead finds Harry in the Goblin's suit. Spider-Man and Norman conclude that Harry's theft and consumption of “Gobulin Green” resulted in the Goblin persona to fight the Big Man. After Spider-Man agrees to keep Harry's secret on the condition that the villain never reappears, Norman embarks on a tour to Europe with Harry so his son can overcome the addiction. In season two, the Goblin resurfaces to orchestrate his consolidation of power. He manipulates Hammerhead into arranging a conference between Tombstone, Silvermane and Doctor Octopus, resulting in Spider-Man eventually taking down all three crime lords. Now the new "Big Man" crime boss in New York, the Goblin once again tries to kill Spider-Man, first by using Molten Man, and then by trapping Spider-Man in an advanced prison alongside many criminals put away by the web-slinger. In the series finale, the Goblin has a final showdown with Spider-Man. The truth of the villain's identity is finally revealed: Norman was the man in question all along and even framed Harry to protect his identity. Norman justifies his actions by claiming he's protecting Harry. A grueling battle with Spider-Man sends him crashing into a stash of his own pumpkin bombs (but Norman is shown to have survived). The Norman Osborn version of Green Goblin appears in the Ultimate Spider-Man cartoon series, voiced by Steven Weber. This version is an amalgam of the Ultimate Marvel iteration and the original incarnation; he has the Ultimate iteration's green-skinned monster appearance yet retains the original incarnation's use of a glider and pumpkin bombs. The Norman Osborn version of Green Goblin makes a cameo appearance in Marvel Disk Wars: The Avengers. Willem Dafoe as Norman Osborn/Green Goblin for Spider-Man. Willem Dafoe appears as Norman Osborn's version in the 2002 film Spider-Man, while James Franco appears as Harry Osborn's depiction in Spider-Man 3. In the 2002 film, Norman Osborn is portrayed as the strong-minded yet troubled head of Oscorp who has a distant relationship with his son while possessing a deep respect and admiration for Peter Parker. The Green Goblin is depicted as an alternate personality, separate from Osborn who "speaks" to him through a mirror in his home. Acting as the unhinged enforcer of Norman's desires, The Goblin claims that Norman is too weak to achieve them himself. At the start of the film, problems arise for Osborn when he faces the threat of losing a military contract should a super soldier formula he is working on not receive proper human testing. As the loss of military funding would likely mean the end of his company, the desperate Osborn tests the formula on himself which simultaneously grants him super strength and drives him insane. 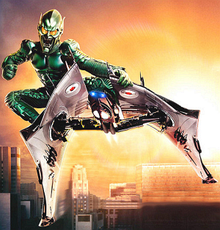 Upon transforming into The Goblin, the delirious Norman steals Oscorp's experimental one-man flight vehicle known as "the glider" alongside the device's cybernetic flight suit. Weeks later, at a rival company's weapons demonstration, the Goblin appears from out of the sky atop the glider and kills the military contractors who threatened to pull out of their deal with Oscorp. With the principal threats to Oscorp's stability eliminated, things seem to turn up for Norman. As the months pass, however, the same rival corporation that the Goblin had previously attacked, unexpectedly resurfaces with a hostile bid to buy out Oscorp. Having been won over by the offer, Oscorp's main shareholders unexpectedly oust Norman from the company's C.E.O. position. This act of betrayal prompts The Goblin's reappearance to kill the majority of the board-members at Oscorp's World Unity Festival. The Goblin's attack is soon impeded by Spider-Man's intervention to drive off the ghoulish terror agent. The Goblin quickly forms a begrudging respect for Spider-Man and even attempts to persuade the hero into joining forces. But Spider-Man denies this request, resulting in The Goblin vowing to kill. After managing to discover that Spider-Man is actually Peter, The Goblin prompts Norman to attack Parker's loved ones, injuring May Parker and kidnapping Mary Jane Watson. During their final confrontation, the Goblin is bested by Spider-Man in combat and reveals his true identity. In his final attempt to kill Peter, Norman activates his glider via remote-control and he himself is ultimately impaled after being accidentally caught in the oncoming glider's path. Before dying, Norman tells Peter with his last breath "don't tell Harry", not wanting Harry to realize the monster he had become. In grief and frustration, Harry later holds Spider-Man responsible for Norman's death, not knowing that his father was the villain that had been terrorizing the city. The Green Goblin legacy is alluded in Spider-Man 2. A vision of Norman Osborn appears after Harry Osborn's alliance with Doctor Octopus. Norman's vision demands that his son avenge his death. Harry shatters the mirror and discovers Norman's hidden lair, realizing that his father was the Goblin. In Spider-Man 3, Harry Osborn finally decides to enact revenge as the New Goblin. Despite the character's comics counterpart having used the Green Goblin identity, Spider-Man 3 opts for the New Goblin name instead. But the character is never actually referred to as said name within the film's dialogue despite being identified by this name within the film's credits and promotional material. The young Osborn submits himself to the same performance-enhancing gas as his father and adapts most of the Goblin's leftover weapons into his own arsenal. During his first altercation with Peter Parker, Harry is knocked unconscious and comes down with a bout of amnesia as a result. After briefly forgetting his vendetta, a new vision of his father returns and successfully sways him back to the path of Spider-Man's destruction. During their altercation, Peter mockingly refers to him as Goblin Jr.. Ultimately, New Goblin later helps Spider-Man in the final battle against Venom and Sandman after his butler informs him of the truth surrounding Norman's death. Harry ends up meeting a similar fate as his father, though to a much nobler end, as he winds up sacrificing his life in order to prevent Venom from killing Peter. Harry Osborn/Green Goblin in The Amazing Spider-Man 2, played by Dane DeHaan. Harry Osborn and Norman Osborn appear in the 2014 film The Amazing Spider-Man 2, with Harry portrayed by Dane DeHaan and Norman portrayed by Chris Cooper. After Harry comes home from boarding school, Norman reveals that he is dying from the (fictitious) retroviral hyperplasia which is genetic. Harry learns he also has the disease, and he's now at the age when it first begins to develop. After Norman left behind all his research, Harry learned that Richard Parker and Norman were working on a cure using the genetically-altered spiders. Realizing that a cure exists in the form of Spider-Man's blood, Harry asks Peter Parker's help to find Spider-Man. Spider-Man visits Harry and tells him of being afraid that a blood sample could either kill him or he could end up like Dr. Curt Connors. His assistant Felicia Hardy tells him that the spiders' venom before the spiders were destroyed was extracted and was stored in Oscorp's Special Projects division. Donald Menken frames Harry for Max Dillon's accident and the experiments performed at Ravencroft Institute for the Criminally Insane, and Harry is kicked out of Oscorp. Harry goes to Electro and the two join forces. Electro helps Harry get into Oscorp's Special Projects, and Menken takes Harry to the spider venom and injects the venom into Harry. Although it initially appears to have worked, Harry's condition is instead accelerated, mutating him into a goblin-like creature and steals a prototype suit and a glider. After Spider-Man and Gwen Stacy defeat Electro at Oscorp's Power Plant, the Green Goblin arrives and learns Peter's identity when he sees Gwen at the scene. He swears vengeance against Peter, saying that he takes away hope and that he is going to do the same to Peter. The Goblin then snatches up Gwen to atop of Oscorp's power plant's clock tower and drops Gwen through the glass roof. Peter and the Goblin battle as Gwen watches on, though ultimately Gwen is killed when the clock tower's gears fall apart. The Goblin is knocked unconscious and later imprisoned in Ravencroft, where he meets The Gentleman and arranges for a team to be assembled to take down Spider-Man, starting with Aleksei Sytsevich as the Rhino. Both Chris Cooper and Dane DeHaan were set to reprise their roles in the Sinister Six spin-off and The Amazing Spider-Man 3, with Norman Osborn successfully coming back to life after freezing his head and going on to be the Sinister Six's leader. But due to Marvel Studios and Sony reaching a deal to produce a second reboot of the Spider-Man film franchise, the sequel and spin-off were cancelled. The Norman Osborn version of Green Goblin appears in Spider-Man: Into the Spider-Verse, voiced by Jorma Taccone. In the film, the Goblin featured within the main events of the story is a native of Miles Morales' dimension which draws heavy inspiration from the Ultimate Marvel universe. While this depiction is primarily based upon the Ultimate comics iteration, visual elements from various other previous incarnations are also amalgamated into the character's design. The Goblin is one of Kingpin's henchmen, battling the Spider-Man of Miles's universe during the first test of the Super-Collider. The Goblin shoves Spider-Man into the collider's blast, severely injuring his opponent. This also causes an explosion which kills the Goblin as his corpse buried in rubble is discovered by Miles. In the older Peter Parker’s introduction, the hand of his Green Goblin can be seen in a montage. The Green Goblin's first video game appearance was in the 1982 Atari 2600 Spider-Man game. The Norman Osborn version of Green Goblin was a boss in the Spider-Man arcade game. Though not the final boss, he is often acknowledged as being the hardest. The Norman Osborn version of Green Goblin was a boss in the 1995 Spider-Man Animated Series video game adaptation. The Norman Osborn version of Green Goblin appeared as a boss in the Super Famicom game The Amazing Spider-Man: Lethal Foes. Both versions of Green Goblin appear in the 2002 Spider-Man video game, with Norman Osborn voiced by Willem Dafoe and Harry voiced by Josh Keaton. The main antagonist and final boss character, the Goblin's genesis in the game parallels that of the film, with Osborn and his scientists attempting to capture Spider-Man in order to study his genetics to perfect their own contracted super soldier serum. The game features a bonus story mode where Harry takes on the Goblin role and investigates a plan to take over Oscorp. The Ultimate iteration of Green Goblin briefly appears in the 2005 Ultimate Spider-Man video game, voiced by Peter Lurie. He is held captive by S.H.I.E.L.D. since he is such a dangerous threat, but the Beetle has sneaked into the headquarters and frees the Goblin, having him go on a rampage throughout New York. The Norman Osborn version of Green Goblin makes a major appearance in the Nintendo DS and Game Boy Advance exclusives of Spider-Man: Battle for New York. He is one of the two playable characters (alongside Spider-Man) and the game is a retelling of his origin. Green Goblin in Spider-Man: Friend or Foe. The Norman Osborn version of Green Goblin appears in the Nintendo DS version of Spider-Man: Web of Shadows. Black Cat informs Spider-Man that the Goblin is setting up bombs as part of a plot to defeat the symbiotes. The New Goblin (Harry Osborn) appears in the Spider-Man 3 video game, voiced by James Franco. He tries to take out Peter Parker as a boss and later assists in dealing with Sandman and Venom as a playable character. He is also a downloadable character on the game's Xbox 360 version. In the game's limited PlayStation 3 edition, he is unlockable and is downloadable for the normal version as well. Both iterations of Green Goblin appear in Spider-Man: Friend or Foe, with original version voiced by Roger L. Jackson while Josh Keaton reprises his role as New Goblin. The Ultimate version of Green Goblin is the primary antagonist of Ultimate Spider-Man: Total Mayhem. The Noir version of Norman Osborn appears in Spider-Man: Shattered Dimensions, voiced by Jim Cummings. When he gets a piece of the Tablet of Order and Chaos, Osborn decides to see if the piece would enhance him like with Hammerhead and the Vulture, and transformed into a monstrous form (similar to his Ultimate counterpart) with sheer levels of strength. The Norman Osborn version of Green Goblin appears in the Spider-Man virtual pinball game for Pinball FX 2 released by Zen Studios. Several variations of Green Goblin appear as bosses in the Spider-Man Unlimited video game, including the mainstream version, the Gold Goblin, the House of M iteration, the Grey Goblin and Menace. In the game, the other Goblin characters are alternative reality versions of the mainstream version. The Norman Osborn iteration of Green Goblin appears in Disney Infinity: Marvel Super Heroes as a playable character. The first live-action iteration of Green Goblin is one of the three villains encountered in Stern's Spider-Man Trilogy pinball machine. Here, The Goblin is represented by a small figurine of the character riding atop his signature glider alongside various illuminated images of pumpkin bombs dotted along his domain of the play field. In the game, The Goblin has three stages: World Unity Festival, Suffer the Children, and Godspeed Spider-Man. The Norman Osborn version of Green Goblin appears as a playable character in Marvel: Ultimate Alliance 2, voiced by Armin Shimerman. His Thunderbolts design is his default costume and the Hobgoblin's Secret War design is an alternate costume. He is among the supervillains controlled by the S.H.I.E.L.D. Control Nanites. During the fight at a chemical company, the Goblin, Bullseye, Lady Deathstrike and Venom end up going rogue when the Control Nanites take on a mind of themselves. The heroes fight him and Venom while Nick Fury disarms the bombs. The heroes fight the Goblin and Venom again in Wakanda. When they are defeated there, the Goblin and Venom are freed from the control and can be playable. In the PSP, Wii and PS2 versions, the Green Goblin fights the heroes in Prison 42 alongside the Scorpion. The Norman Osborn version of Green Goblin's classic color scheme is seen as one of Firebrand's alternate costumes in Ultimate Marvel vs. Capcom 3. Norman Osborn appears in Marvel Super Hero Squad Online; Green Goblin (voiced by Yuri Lowenthal) is a boss character while Iron Patriot (voiced by Charlie Adler) is a playable character. The Norman Osborn version of Green Goblin is available as downloadable content for the game LittleBigPlanet as part of "Marvel Costume Kit 4". The Norman Osborn version of Green Goblin is featured as a boss in the Facebook game Marvel: Avengers Alliance. The Norman Osborn iteration of Green Goblin appears as a villain and playable character in Marvel Heroes. The Norman Osborn version of Green Goblin appears in Lego Marvel Super Heroes, voiced by Nolan North (original version) and by John DiMaggio (Ultimate Spider-Man cartoon series iteration). The Norman Osborn version of Green Goblin appears as a playable character in Marvel Contest of Champions. The iteration of Green Goblin from the Ultimate Spider-Man cartoon appears in Disney Infinity 3.0, voiced by Nolan North. The Norman Osborn version of Green Goblin is a playable character in Marvel: Future Fight as both his original version and as the Ultimate iteration. A modernized iteration of Green Goblin appears as a villain in Marvel: Avengers Alliance 2. The Norman Osborn version of Green Goblin is a playable character in the match-three mobile game Marvel Puzzle Quest. He was added to the game in February 2016 and was the first villain to appear in the game's "five star" rarity category. The Norman Osborn version of Green Goblin is a playable character in Marvel Avengers Academy, voiced by Brandon Winckler. The Norman Osborn version of Green Goblin is a playable character in Lego Marvel Super Heroes 2. His 2099 counterpart is also playable. The Norman Osborn version of Green Goblin makes a cameo appearance in Marvel vs. Capcom: Infinite as part of one Spider-Man's Hyper Combos where Spider-Man dodges and uses his bombs to attack the opponent. The Norman Osborn version of Green Goblin will appear in Marvel: Ultimate Alliance 3: The Black Order, though it is unknown if he will be a playable character again. The Green Goblin and along with other Marvel characters have appeared in Universal's Islands of Adventure. The Green Goblin was one of the characters portrayed in the 1987 live adaptation of Spider-Man's and Mary Jane Watson's wedding performed at Shea Stadium. The Green Goblin appears in the 2011 musical Spider-Man: Turn Off the Dark. The Green Goblin appears in the 2014 Marvel Universe: LIVE! stage show. Various Green Goblin figures from the Spider-Man: The Movie toyline. The first ever Green Goblin toy was manufactured in doll-form by Mego in 1974. Standing eight inches tall, this figure sported a cloth outfit with rubber boots and a plastic bag of tricks as its only accessory. Mego would later produce two other smaller, hard plastic figurines in 1976 and 1980 for their Comic Action Heroes and Pocket Superheroes lines, respectively. In 1978, Remco manufactured their "Energized" Green Goblin figure. Standing over a foot in height, this battery operated figure came complete with an energy belt, web cutter purse, and a bat-shaped flashlight. A Green Goblin figurine was included as an accessory for Corgi's 1979 "Spider-Buggy" vehicle. Toy Biz created a proper Green Goblin action figure in 1991 for their Marvel Superheroes line. This six inch figure came packaged with a pumpkin bomb accessory, glider, and featured a "bomb throwing" action feature. The Green Goblin was released in 1994 as part of Series 3 of Toy Biz's Spider-Man: The Animated Series Line. An interesting note is that while the figure is based upon the character's animated counterpart, it features a glider molded after the one seen in issues 199 & 200 of Spectacular Spider-Man (1993). Toy Biz released a total of eight Green Goblin figures for their Spider-Man: The Movie toy-line. Including a highly detailed super poseable figure, which was sculpted by Gentle Giant. Toy Biz released their final Green Goblin figure in 2006 as part of the "Onslaught Series" of their Marvel Legends line. Upon resurrecting the Marvel Legends banner, Hasbro created another Green Goblin figure in 2016. Way Out Toys released two separate Green Goblin bobble-heads in 2002 and 2003, the first being based on the character's classic comics outfit and the second showcasing the character's Ultimate Comics design. The Green Goblin has been featured twice as the Twelfth and Sixty-Sixth figures of Diamond Select Toys' Marvel Select line. The Green Goblin is number 109 in Funko's extensive POP! Vinyl line of super deformed figurines. Funko had also previously released a Green Goblin bobble-head as part of their Spider-Man themed Wacky Wobbler series in 2009. ^ Salemme, Danny (April 24, 2018). "Into The Spider-Verse Includes Classic Spider-Man Villains". Screen Rant. Retrieved May 4, 2018. ^ Ching, Albert (July 23, 2011). "SDCC 2011: MARVEL Television LIVE!". Newsarama. ^ Burlingame, Russ. "Marc Webb Spills on Sinister Six and Amazing Spider-Man 3". comicbook.com. ^ "Peter Parker & The Sorcerer Stone". Progressiveboink.com. 2005-05-10. Retrieved 2010-11-12. ^ "Marvel Pinball Preview". www.g4tv.com. Retrieved 2014-02-15. ^ Narayan Pattison (2008-07-15). "IGN: E3 2008: Marvel Ultimate Alliance 2 Character Announcements". Ds.ign.com. Retrieved 2010-11-12. ^ "Marvel Costume Kit 4". Sony. Archived from the original on December 29, 2012. Retrieved December 30, 2012. ^ O'Connor, Alice (16 May 2017). "LEGO Marvel Super Heroes 2 KONK!ing to November". rockpapershotgun.com. Retrieved 16 May 2017. ^ Gross, Michael (June 2, 1987). "SPIDER-MAN TO WED MODEL". New York Times.